Economics: Public Economics, International Economics, Banking and Financial InstitutionDevelopment Economics, Monetary Economics, Financial Economics. Business and banking management:Finance and wealth management, Marketing, Human Resource Management, Strategic Management, Operations, Entrepreneurship, Banking Ethics, Banking Operation and Management. The submitted manuscript is first reviewed by an editor. 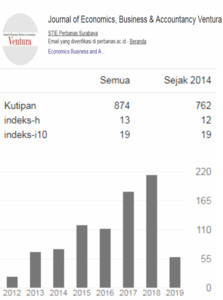 It will be evaluated in the office, whether it is suitable for Journal of Economics, Business, and Accountancy, Ventura (JEBAV) focus and scope or has a major methodological flaw and similiarity score by using Turnitin. Degree of up-to-date and the reference of primary book sources. JEBAV is published quarterly, in (April-July), (August-November), and (December-March). Every article submitted to Ventura will not have any 'Article Processing Charges'. This includes submitting, peer-reviewing, editing, publishing, maintaining and archiving, and allows immediate access to the full text versions of the articles. In publishing, Journal of Economics, Business, and Accountancy, Ventura (JEBAV) strongly against any case of plagiarism on its own merits. Journal of Economics, Business, and Accountancy, Ventura (JEBAV) commits to deterring plagiarism, including self-plagiarism. The authors should ensure that they have written entirely original works, and if the authors have used the work and/or words of others that this has been appropriately cited or quoted. Papers found with such problems are automatically rejected and authors are so advised. Also, significant parts of the work have not been published. 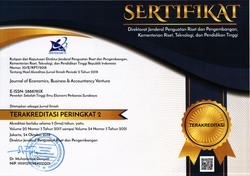 The author also respects entirely Author Guideline of Journal of Economics, Business, and Accountancy, Ventura (JEBAV) regarding the redundant, duplicate or fraudulent publication. Before the author(s) submit the manuscript to Journal of Economics, Business, and Accountancy, Ventura (JEBAV) please conducting check first for similarity. The Article has not been published in other media and does not contain elements of plagiarism. We recommend that the authors should use reference management software, such as Mendeley, Zotero, or RefWorks. Every article accepted by Ventura shall be subject to have passed the Grammarly® writing-enhancement program conducted by Ventura Editorial Board.